"I got a hike of 4 lacs in salary by adding digital marketing skills to my resume." An Interview with Mr. Shitiz Singh, Account manager in IDEACTS and DSIM’s Ex-Trainee. He shares with us how a simple MBA or graduation is not going to guarantee a career. One needs to posses additional skill sets. He also shares how he got a hike of almost 4lacs on his salary in the new job after getting trained in digital marketing and reviews DSIM. Q1.Hi Shitiz! We have heard you recently switched your job. Currently you are working as an account manager with IDEACTS. So tell us something about your new job profile. Ans. Well, my job domain has always been Advertisement sales throughout my career; I work in the same function over here. Wherein I need to make tie ups with various brands/corporates & bring their advertisements on our platform thereby contributing to the revenue source of my company. My current organization is an internet media company. Q2. Ideally I should not have asked for but still we are so curious to know about the package that you are drawing from here. Would you like to tell us about that? Ans. Well! It’s around 8 lacs per annum…I got a hike of 4 lacs in salary by adding digital marketing skills in my resume at DSIM.. But I got this much because I am in a sales domain. Q3. Wow! It’s a good package. So why don’t you tell us something about your journey to this job as in what all challenges did you face up till now in your career. Ans. Right from the start of my career I have been in the sales function & that too in advertisements. So I started out my career with Radio background & then moved to digital. So every day is a challenge in its own given manner in every job. I have seen my ups & down as well. But considering that digital industry is growing at a much higher rate than any other medium so I have my obvious choice made and also lucky enough to got this opportunity. Q4. Of course the digital marketing industry is growing at quite a faster rate. Anyway, when did you actually decide to go through the digital marketing training? Ans. I have done my PGDBM in marketing & finance from Appejay school of management in delhi, after that it was almost 4 ½ yrs of my career & I felt the need to enhance/upgrade my knowledge. Digital/online marketing is the next big thing currently considered as far as other conventional mediums in advertisement and marketing are concerned, so that becomes my motivation or my ladder to move up in my career as well. Q5. Can you please help us with review of DSIM.Did this training help you? If yes how? Ans. Yes to a great extent. I cannot completely attribute this training towards grabbing my current designation, but in a way it did. Digital marketing knowledge is the right spice that your career needs to taste good. As on date, a digital marketing qualification is a wonderful patch to fix your career. Q6. So how did you find DSIM? Did the coffee or the lemon tea taste well? Ans. So you really want me to review DSIM (smiles). It was good & enriching. The faculty is very patient & understanding as far as your needs/curiosity is concerned. Clarifications are handled with utmost respect & in a specific way as far as an individual is concerned irrespective of his/her background. And…yes…the coffee and the lemon tea were very tasty! Q7. Well! It was simply great talking to you Shitiz however before we end the conversation if you could advise something to the young job seekers to learn something from your experience? Ans. See guys! If you are looking to upgrade your career or settle your career then digital marketing is a nice field. It is an upcoming industry and there are lots of opportunities available especially at the entry level. This is all I want to say. Besides, go ahead identify your area of interest and upgrade your skills in that area. A simple MBA or a graduation is not going to help you settle your career. 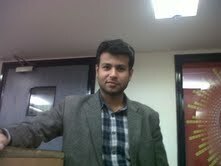 Shitiz Gohri completed his Internet marketing training from Delhi School of Internet Marketing in Jan 2013.